The plan for the operation, in the middle of January 1944, was for the 46th Division to attack on the right and capture high ground beyond the river; the 5th Division, which had been transferred from the Adriatic front, was to move on the left; and in the centre, 167 and 169 Brigades were to cross through 168 Brigade, which was to follow them over. On the 46th Division sector the hills rose straight from the river; on the other two sections there was a plain between one thousand and three thousand yards deep before the ground rose sharply. This plain extended for about ten thousand yards from the sea on the west. The German plan, as was learned later, was to hold the low ground comparatively lightly, sow it extensively with deeply buried box‑mines which consisted of little except wood and explosive, thus giving hardly any response to mine‑detectors and to hold positions on the high ground behind. From there they could observe the projected crossing‑places along the river below. Dominated as it was by enemy‑held mountains and foothills in the background, the plain was barely wide enough to concentrate a large force. In fact no such force was available for the operation. It had been devised by High Command to coincide with the landings on the beaches at Anzio, which were intended to draw troops away from other fronts in Italy. The assault began at 2100 hours on January 18. A small red ball floated across the still, star‑spangled sky and landed gently as thistledown on a German post over the river. That was the signal. Five hundred guns of all calibres thundered a terrific bombardment. Under cover of a smoke‑screen and with covering fire by men of the London Irish and other supporting troops, the Queen’s Brigade and 167 Brigade swept across, some of the latter in assault boats manned by men of the battalion. As the British troops neared the opposite bank, German eighty‑eight’s spat viciously overhead or in the river. On the south bank mortars kept up a bombardment in close support; the three‑inch mortar platoon of the London Irish, under Lieutenant DA Hardy, alone fired over six hundred rounds in less than sixty minutes. The river was fifty to one hundred yards wide, and was running strongly and fast, owing to the winter rains. It was far too swift on the right, where the banks were precipitous, so that the 46th Division was unable to land. The crossings by the 56th (London) Division and the 5th Division, farther down the river, went according to plan. By dawn on the 19th, a bridgehead had been forced, including the small town of San Lorenzo which guarded the approaches to Castelforte and the valley beyond. On the evening of that day, German reaction developed and the London Irish were suddenly sent across to help make 167 Brigade’s landing secure, to occupy San Lorenzo, and to prepare to attack Castelforte at once. Rising above the river in front of the 56th Division was Monte Damiano, with lower spurs running south and east. In the heart of the hills north‑east of Damiano, was the small town of Castelforte, which was connected to the valley below by two nearly parallel roads. In the valley was a third road along the lower edge of the mountain. Where the roads from Castelforte met this road stood San Lorenzo. The Commanding Officer and his “O” Group, crossing ahead of the battalion established themselves in a farmhouse about a thousand yards from the banks and roughly midway between the river and Monte Damiano. The house was well observed by the Germans, and consequently it was heavily shelled. Several direct hits were made, but it had thick stone walls and suffered surprisingly little damage. Battalion headquarters of the Oxford and Bucks was housed there also, and there was a certain amount of confusion with two staffs in conference at the same time, and with dispatch riders and runners coming and going. There was an animated scene which added to the chaos when an officer discovered he had lost his only pair of blue silk pyjamas and suspected he had been robbed. A search of the building was made, and even the kit of other ranks was examined, but the garment was never found and the officer had to sleep in his pants until such time as he managed to acquire another pair. The main body of the battalion crossed the river and harboured in various farms near the river, waiting for orders to attack Castelforte. They came under shell and mortar fire, and Major H Lofting, commanding ‘B’ Company, was wounded. Captain Bonham‑Carter took over the company. Shelling continued, while the work of getting supplies over followed. This job was a pretty tough one, for the enemy were doing their utmost to prevent a build‑up in strength. The ground from the river was, pitted with shell holes, and the men scrambled and struggled up the slopes with their heavy burdens. A strong patrol led by Lieutenant Mills went out about midnight with orders to clean up Castelforte prior to the continued advance by the brigade. Higher Command believed that the town was held only by rear‑guards. The patrol went along the right‑hand road from San Lorenzo .and met strong opposition on the outskirts of the town. Lieutenant Mills sent back all the patrol except himself and three men and decided to remain and find out all he could about the German strength in the town. He was wounded, but managed the following night to stumble into the headquarters of A Company, where he made his report. Covered with blood; and wounded in several places, he gave an outline of what he believed was the position and revealed what had not been known before‑that the enemy had brought up some tanks into that difficult locality. The three other ‑men did not return. Captain Strick then went out with his battle patrol on a further reconnaissance of the enemy’s positions, and this time they avoided both roads and cut across the hilly ground in between. With two non‑commissioned officers and six riflemen, Captain Strick set out at one o’clock in the morning and in the moonlight got to the outskirts of Castelforte in an hour, which was very good progress. At the first block of houses Captain Strick passed down a side street, hoping to get round to the other side of the town without being seen. It was suspected that the houses were full of booby traps and mines. The patrol halted at a road junction and divided, Captain Strick going in one direction with four men and the others in another. Suddenly there was a loud explosion and they all threw themselves to the ground. They thought they had been discovered and that a hand grenade had been thrown. A quick look round revealed that some of the party had been hit by a mine. The patrol sergeant, Sergeant G Murphy, was killed, another man was badly wounded, and Captain Strick had injuries not so serious to his arms and side. The wounded man was hurriedly attended and left under the protection of some trees. Captain Strick, despite his wounds continued forward cautiously with the remaining adventurers. At one time they heard German voices, and as they carefully approached what they took to be the main street of the town they saw a large body of Germans marching along. They had a further quick look round and were satisfied that Castelforte was held in considerable force, and not by just a handful. Then, as Captain Strick was beginning to feel the effects of his wounds, they set off on the return journey. They found the wounded man propped up against a tree, calmly smoking a cigarette, and they put him on a ladder and carried him to a house nearby. Luckily they were clear of the German positions, but instead of being empty, they found the cellar of the house filled with men, women, and children, all natives of the town, who had sheltered in one of the few buildings not demolished by the artillery bombardment. They had refused to leave and had preferred to run the risk of staying in “no‑man’s land” while the battle swirled past. They were able to give Captain Strick valuable information about the mines and traps in the area. The patrol then left, rejoining the second party, who also had succeeded in avoiding the enemy, and they returned safely to headquarters with their mission accomplished. In spite of the reports from the London Irish patrols, the capture of Castelforte was still regarded by higher authority as a minor operation, and that only one company, or at the most two, should make the attack. Colonel Good decided to attack with two companies; ‘C’ Company under Major Cummins to proceed on the flank west from San Lorenzo and to take advantage of cover from the woods on the lower slopes of Monte Damiano, while ‘A’ Company on their right, under Captain Grace, was to attack from the south. ‘D’ Company was to cover the other companies from the higher slopes of the mountain. ‘D’ Company reached their objective and dug in by scraping about eighteen inches of earth from among the rocks and building stone sangars round the shallow holes. They proved rather uncomfortable shelters, as shell and mortar bursts caused not only metal to fly but also a hail of chipped rock. The attack started at 1100 hours in daylight. The line of advance was incredibly difficult for everyone. The slopes of Monte Damiano were terraced with steps of chipped stone and packed earth, each six to eight feet high, and the flat terraces between each step were covered with dense trees, through which the troops had to struggle. Major Cummins got as far as he could with his men, and then went forward to observe the enemy. It was obvious that the Germans were well prepared and on the alert. They intended to stay until they were forced out by overwhelming strength. There were tanks and self‑propelled guns in close support of their infantry. The small reconnaissance party from ‘C’ Company was discovered, and in a brush with an enemy post Major Cummins was wounded and was unable to regain contact with his company. As both ‘A’ and ‘C’ Companies had reached a point where they were almost exposed to view from the town and any movement attracted the German gunners, it was considered unwise to attempt any further advance by day. A night attack was arranged. This began at 0100 hours, after an artillery preparation which had opened fifteen minutes too soon. It was understood that the London Irish attack would synchronise with one by a battalion of the Queen’s from the north and farther up the river. That proved not to be so. Captain W Byrne, who had assumed command of ‘C’ Company, launched his men forward unsuspectingly and the company ran into a strong force of Germans hidden in a wide ditch. The enemy allowed most of the company to pass by and then opened up with small arms. The forward sections of the company were killed or captured, but the remainder managed to extricate themselves in the darkness. ‘A’ Company, on the right, also had a bad time. As they crawled through the enemy wire and mine‑fields, the Second‑in‑Command, Lieutenant Crampton, trod on an “S” mine. Instead of throwing himself down as trained to do and in that way possibly escaping personal injury, he kept his foot firmly on the mine. This delayed the mine’s jump in the air before it exploded. Lieutenant Crampton called out to everyone round him to get down, and as they did so the mine blew up on the ground, destroying one of Lieutenant Crampton’s legs. His action undoubtedly saved the lives of several men near him and was a fine example of cool, calculated courage and lightning decision. Lieutenant Crampton remained seriously ill for some time, but fortunately recovered. He was awarded the George Medal for his action. The rest of the company moved on into the south of Castelforte and got there just before dawn. Contact with them then was lost. Their wireless broke down and runners were unable to get through. For twenty‑four hours there was no word, and as a party was being organised to go to their aid, a faint call was picked up by signallers at Tactical Headquarters. It gave ‘A’ Company’s call sign but it could only just be heard, and indicated that at least one member of the company was still alive. An hour or so after dark on this second day a patrol, consisting of a non‑commissioned officer and two riflemen, reached Tactical Headquarters from ‘A’ Company. They told a remarkable story. It appeared that when Captain Grace had realised he could not continue to advance along the line of the upper road from San Lorenzo, he turned back and worked his way with his men along the right‑hand road to Castelforte. All went well until they reached the edge of the town, when for the second time they ran on to a mine‑field. Captain Grace and a few others were wounded, but they all managed to get into two unoccupied houses on the fringe of the town before light came. Though they were completely surrounded by Germans no one came near them, but they had a nasty shock when two enemy self‑propelled guns drew up alongside and fired some rounds towards the river. The enemy did not suspect that they had a party of the London Irish in their midst. German soldiers went in and out of other houses in the vicinity, but no one came near ‘A’ Company. Had they revealed their presence they would, of course, have been at once wiped out. When night came again, the patrol who told this story bravely made their way back to the beleaguered men and very stealthily the depleted company were guided back to the London Irish lines. The enemy now gave further proof that they intended to hold Castelforte and perhaps to throw the British troops back over the river. Counter‑attacks were launched all along the north bank. ‘D’ Company on Monte Damiano and ‘B’ Company in and around San Lorenzo were shelled heavily. Tactical Headquarters was hit, and among the wounded were Major Alec Smith, the able and energetic battery commander of the 65th Field Regiment R.A., and also Sergeant Thurston, of the signals section. One shell bursting on the terraces destroyed a day’s precious water supply. On Monte Damiano, ‘D’ Company Headquarters also got a direct hit, and Captain Sir James Henry, the Company Commander, was, seriously wounded. Another casualty was CSM. McDaid. The company positions were heavily attacked, and in close fighting Lieutenant Morley Mower was killed. The men fought on under Lieutenant Spiller and Sergeant Alf Fry, a splendid non-commissioned officer, whose death later at Anzio was a loss to the battalion. The attack was beaten off, and Sergeant Fry’s fearlessness was an example to all those under him. Major Mahon, the Officer Commanding Headquarters Company, was sent up to Damiano to help with a composite company from headquarters, and the position was held. One of the members of the signals section, Lance‑Corporal F. Norman, was wounded in the arm and leg while serving with D Company on Monte Damiano. His wireless set was damaged, but despite his, wounds and the appalling weather on the mountain‑side he crawled from one slit trench to another and found another set. He crawled back with it, but found that it would not work. He calmly stripped both sets and with parts from each got one set to operate. Communications with battalion headquarters were resumed, and he was then sent back to the regimental aid‑post for treatment. After his wounds had been dressed, he noticed that headquarters, were woefully short of signals personnel, so he quietly settled down to work there. It was not until he was wounded again by enemy shell‑fire that he was forced to give up and was sent to hospital. For his bravery and outstanding devotion to duty Lance‑Corporal Norman received the DCM. The hard fighting continued, and there was tense hand‑to‑hand combat among the sangars and terraces above and in the woodlands below. Farther along Monte Damiano the enemy pressed, but Colonel Baird’s men held firm. FIGHT TO SAVE THE BRIDGEHEAD. All the troops who crossed the Garigliano up to that time had with them only light weapons which they had carried in the boats or rafts. In but a few instances could vehicles such as heavy mortars and anti‑tank guns be ferried over. At San Lorenzo a few tanks managed to get across and they helped in its defence. In this battle a rather depleted A Company under Lieutenant Ray Mullins (later Captain Mullins) joined ‘B’ Company, and when the enemy Panzers tried to force their way through from Castelforte they got an unexpectedly warm welcome and were compelled to turn back. During this fighting Captain Bonham‑Carter was wounded. A fourth day was spent in holding the bridgehead. 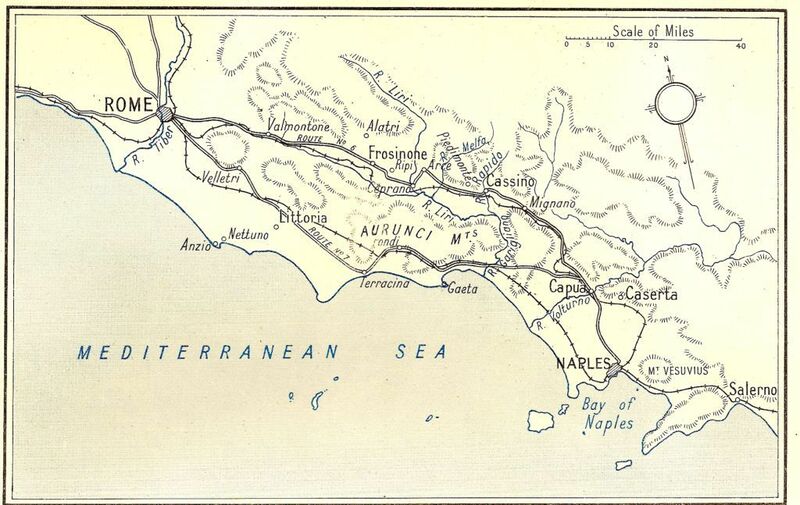 ‘A’ Company joined the gallant garrison on Monte Damiano, and slowly the German effort spent itself. They had suffered very heavy losses with little result, and the Garigliano crossing was secured. Three bridgeheads were made on a seven‑mile front and within a few days they had been enlarged to a depth of two miles. The attacking divisions, the 56th (London) Division and the 5th Division, had attained their main objectives and held them against the fierce reaction of the enemy, but there were no fresh troops immediately available to pass through, the 46th Division having already been called in. A pause, therefore, had to be made. Casualties on our side had been heavy and the London Irish, now sadly weakened, were relieved in the line by the Hampshires of the 46th Division. They went back across the river to Sessa Arunca to rest. While there, news came that Lieutenant Ralph Budd, a former first‑class non‑commissioned officer who rose from the rank of rifleman in the early days of the war to the rank of CSM, and was commissioned in the field, had been killed in his first action as an officer with the London Scottish. Two London Scottish sergeants had been attached to the London Irish on being commissioned. One of them, Lieutenant Henderson, served with ‘C’ Company and died of wounds received at Castelforte; the other, Lieutenant Butch Valentine, was wounded in the fighting with ‘B’ Company at San Lorenzo. Throughout the battle for the Garigliano bridgehead, every man in the battalion had played his part. ‘A’ and ‘B’ Echelons again accomplished an almost superhuman task in getting food, water, and ammunition to the forward companies. Every single box of ammunition and can of water had to be carried by hand to the men of ‘A’ and ‘D’ Companies on the top of Monte Damiano. Climbing the many terraces by day unencumbered was hard enough, but to do it by night, heavily burdened and sometimes under fire, was a magnificent achievement. Never once did the men in the forward lines go short. Great and valuable work was done also by the native African troops who did portering duties during the operation. The London Irish casualties were twelve officers and about a hundred and eighty other ranks, and in a message of commendation to the battalion Lieut.-Colonel Good said the Divisional Commander and the Brigadier had expressed their sorrow at the losses sustained but that the battalion had responded splendidly to the calls made upon it. “Now we must lick our wounds and get ready for the next bout as quickly as possible, making sure that we maintain and enhance the high name of the London Irish Rifles under all circumstances,” wrote the Colonel. Castelforte – A Personal Account. The advance began at 12 noon on 19 January and was supported by three tanks. Two snipers were reported to be in the hills (Salvatito area) and this was confirmed when 3 or 4 bullets whizzed over head but the village of Lorenzo was reached and contact made with C Company at which stage a few mortar bombs came down. A Coy reached the cross roads at the east end of the village and then swing over to the left of the road (and about 50 yards in) running north west. The order of march was 7 Platoon, Coy HQ, 8 Platoon and 9 Platoon, there being a mine detector party to 7 Platoon. On reaching these cross roads, 7 Platoon located fire from a Spandau located in a house about 400 yards distant on the east of the road. The leading tank engaged this target, silenced the nuisance and the advance preceded with one RE as a casualty. A Company next came under fire, after covering some hundreds of yards, from a Spandau and a sniper situated in the high ground to the left. 7 Platoon advanced to tackle this and 1 Bren was opened up on 4 or 5 enemy, who were running north up the road. C Company were … at this stage, higher up the hill and in a distinct hurry to outflank the post just encountered. At this stage, it could be seen that Castelforte was assuming the appearance of being strongly held. It was surrounded by a perimeter of double apron fencing and the road (and also the east road as was discovered later) was blocked by a knife …barbed obstacle. Italians encountered in a cave gave very accurate information stated that the roads were mined on both sides and that there were minefields further out also. They stated that the Germans were at least a company strong on the hill, all of which proved to be true. Owing to mine fields and snipers proving very troublesome at this stage and causing progress to be very slow, it was decided to wait for night fall, especially as the REs and the forward platoon had come under sniper fire when attempting to force when attempting to force their way along the road and had to run back some 100 yards to gain cover. One man (Cpl Friar) was killed and a few casualties were sustained here. After dark, the advance was continued but after the company had run into another minefield and an officer (Lieut Crampton) and 1 OR became casualties. It was decided to attempt a new route to the objective, so the company went east and entered the wadi which runs between the two roads leading to the village. 7 and 8 Platoons advanced up the wadi and 9 Platoon along the road on the right. Good progress was made and about 400 yards from the objective, the company commander sent 7 Platoon forward to the road, 9 Platoon moved into the wadi and made contact. This platoon now went after 7 Platoon and 8 Platoon, under the CSM, was left holding a defensive position by the wadi to protect the flank and rear while 7 Platoon sent forward a patrol to see if the road was clear and also the outskirts of the village. 7 Platoon came under MG fire as it reached knife…barricade across the road and grenades were also thrown out of the windows of the houses. The company commander (Captain Grace) was wounded leaving one officer in the company. He, together with the company commander and several men had left the road and ran into a minefield, light casualties being sustained. This party again crossed open ground and making a detour returned to two houses, 100 yards from the road block where 9 Platoon were straddling the road. Several men made their way back to the same place down the road under heavy MG fire. Captain Grace was able to get away and returned to 8 Platoon, telling them what happened – he was then wounded. The remaining officer then gathered 7 and 9 Platoons together, leaving 8 Platoon in the wadi. 7 and 9 Platoons now occupied the two houses and it was decided, in view of the might of the opposition and the fact that daylight was coming, to remain in the houses all day and go for the objective the next night. Preparations were made for defending the houses and orders was given for silence and no movement. The food problem was not acute, but the water supply was low. However, it was hoped that water could be collected from the wadi after dark at the worst. Latrine arrangements were not all that might be possible, but necessity knows no laws. The men behaved splendidly, and the day provided exciting. Help had been asked for over the wireless but the tank, which did materialise was a German one preceded by ten infantry. This was followed shortly afterwards by a message from Bttn HQ that a spot of bother was being experienced there. The house proved to be an excellent OP and although Germans were only a few hundred yards away on three sides, they did not discover that nearly a company of British troops was in their midst. Information was passed back over the wireless of German dispositions (at least 2 platoon positions) on the face of the hill to the west; of the position of an enemy tank at a road fork at the north west corner of the village; of another German post 200 yards to the east of the company’s position; and of the relief of enemy troops at 1500hrs by a force of about 100 men. At this stage, the wireless gave out and communication was completely cut off. At night, 2 men went back to Bttn HQ with the information and to receive orders. At the same time, a sergeant and two men, who had been hiding in a trench all day, rejoined the company. The company commander (who was the remaining officer) now visited the platoon in the other house and everything was organised for a move, when necessary. It was decided to make for the objective round the back of the village but shortly after midnight, orders were received from the CO to withdraw. This was successfully carried out under the nose of the enemy without a shot being fired via the wadi and Lorenzo. In the field, 27 Jan 1943, Lieut Mullins of A Company, 1 LIR.